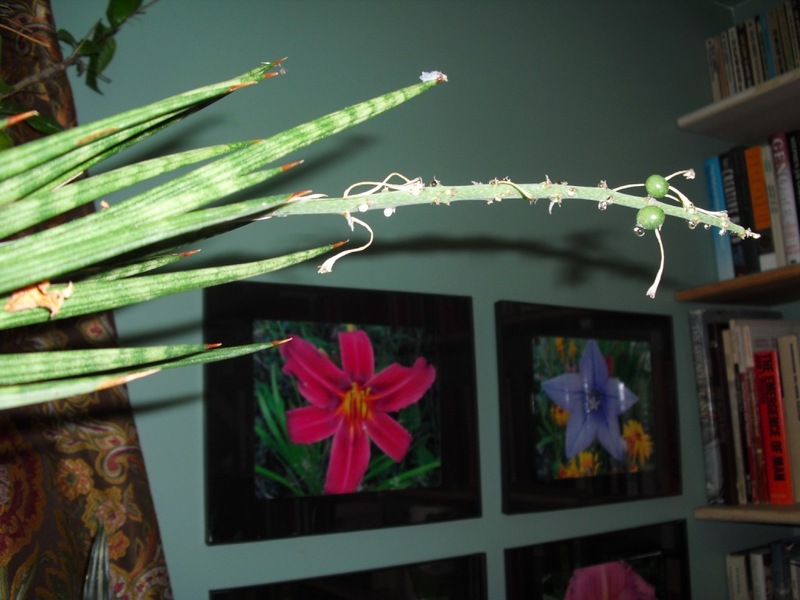 The remnants of Sansevieria francisii flowers, (the thin white things hanging off the stalk) along with what looks like fruit/seed pods. 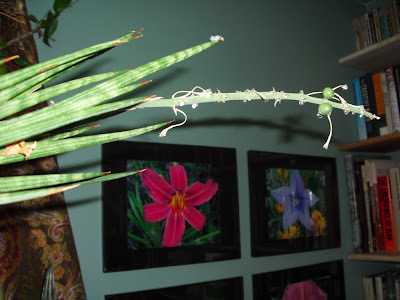 Previously posted picture of the whole plant, from 2009. Right now the small offset seen here is as big as the base plant from which it sprouted. I have no idea if S. francisii is self-fertile, so I don't know if I'll get viable seeds. But I'm going to try to let the fruit ripen, and see what happens. 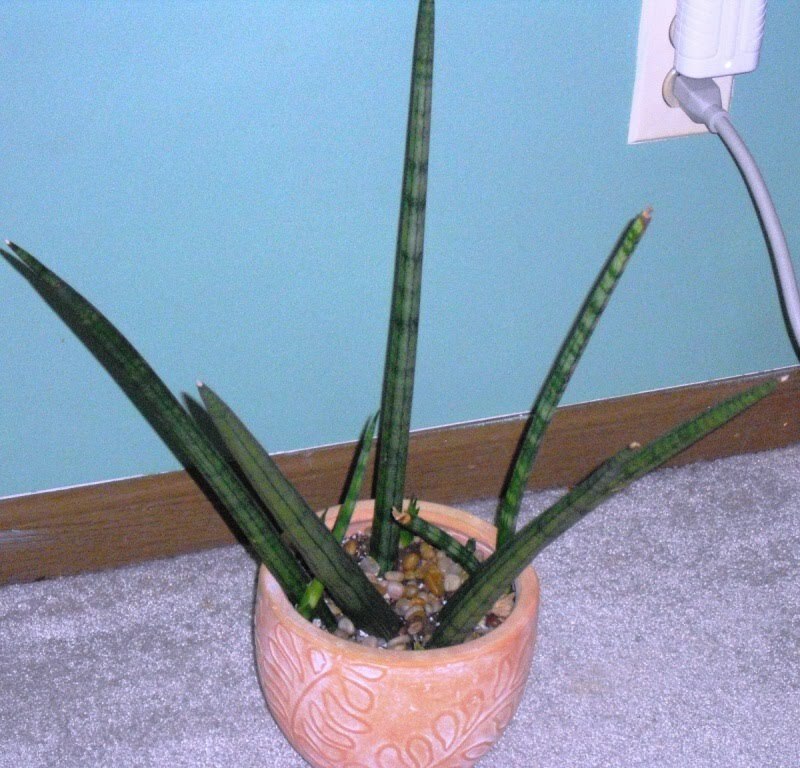 In other Sansevieria news, I have discovered that I have made something of a cultural faux-pas. So that others may learn from my mistake, here is some advice: Never, ever put a plant with a stiff cylindrical growth habit into a clay pot with a rigid inner lip. The irresistible force (growth) will meet the immovable object (pot lip). 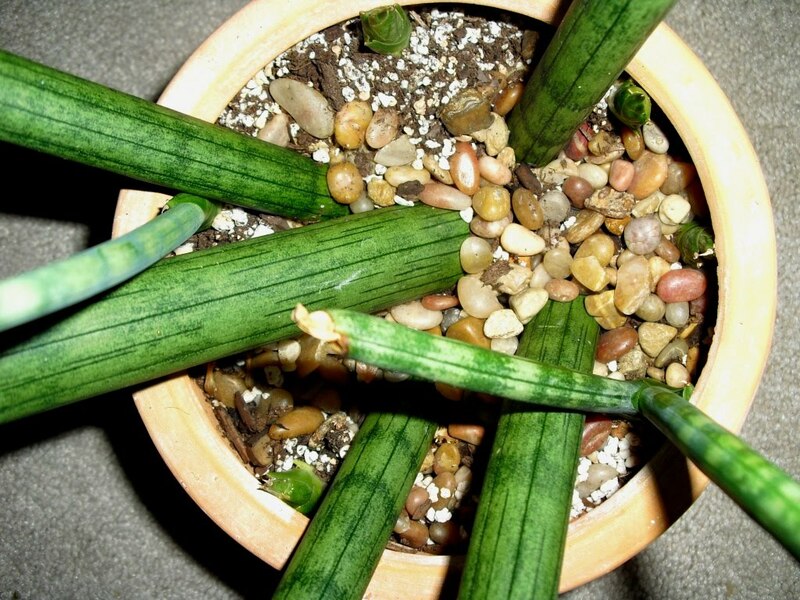 Sansevieria cylindrica, with four new offsets growing all around the edge of the pot. I am going to have to repot before the new growth is injured by the rim. That is what happened to the thin leaf seen pointing to the right in the photo. Even though I managed to direct the growth away from the pot lip, the leaves of that particular offset had a damaged tips which shriveled and had to be cut off. I am very happy that it is producing so many offsets, though. It had been sitting there so long without doing any growing at all. Uh oh bummer! I think I have one in the same sort of pot. I better transplant it quick. Too bad you missed the flower! Darn!